Home Blog Win a TomTom Sat Nav! Win a TomTom Sat Nav! 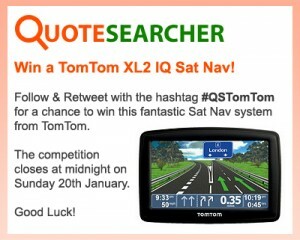 It’s a brand new year, and to celebrate we’re giving away a TomTom XL2 IQ Sat Nav to one lucky winner! Whether you have used our website in the past, or plan to in the future to find caravan insurance, tradesman insurance, taxi insurance – or any type of insurance for that matter! – we want to say thank you by starting 2013 with this great giveaway. All you have to do to enter is follow and RT us on Twitter @Quotesearcher using the hashtag #QSTomTom. The competition ends at midnight on Sunday the 20th of January at midnight, and the winner will be announced once all the RTs are counted, so get entering! We wish you all a Happy New Year and Good Luck! Tom Tom XL2 IQ subject to availability, if unavailable another Sat Nav of the same value will be offered. Win a £100 Gift Voucher for any High Street Shop of your Choice!